The Strawbridge Oak Bedroom Collection boasts beautifully finished solid oak pieces in a variety of sizes to suit every home. This range of furniture combines traditional structure with chic and modern silhouettes . The chests of drawers and bedside lockers are designed for simple storage solutions. The individual pieces are so versatile because of their simple and elegant design so they fit well with many other styles of furniture as well as together as a collection. The Oak Collection Bed, with its curved head and foot boards and sleek slated lines will make a beautiful statement piece in any bedroom. The warm and natural tones of the oak wood are particularly inviting and work very well against stark white and cream interiors. 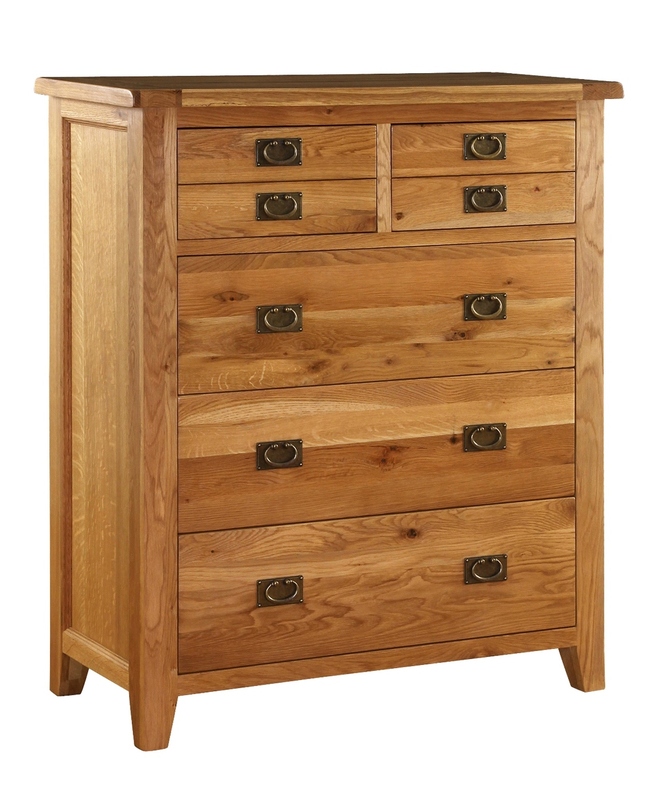 The drop handles on the chests of drawers are in keeping with the Oak Collection style and finish of the design perfectly. The depth of each drawer means that you can store more in each piece and there are a variety of different styles to suit every storage need. As well as bedroom furniture the Oak Collection has a range of kitchen, dining room and living space furniture. Click here to see the full Strawbridge Oak Collection. As this collection of furniture is made from solid oak, you will discover that it has its own characteristics. The natural features can come in the form of small cracks, knots and grain pattern variations and only serve to enhance the furniture’s natural beauty and charm. Visit us at the Shopping Courtyard in Mount Usher Gardens, Ashford, Co. Wicklow to see a selection of our furniture range and home accessories. Click here for directions to our location. These pieces are available to order from our showrooms or by phone on 040440502. Ask our friendly staff about our delivery services.